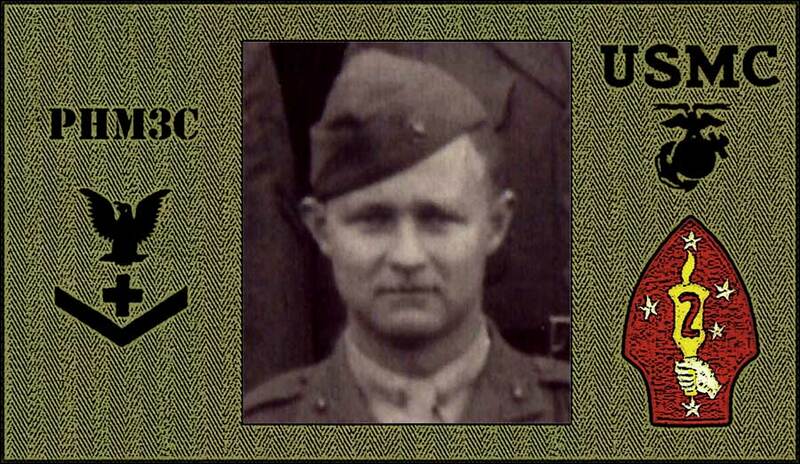 The events of November 21 and 22, 1943 would be PhM3c Lyle Hoatson's first and last combat experiences. He had joined the 1st Battalion 6th Marines in New Zealand, after they had returned from Guadalcanal. The Marine assault on Betio Island, Tarawa Atoll, British Gilbert Islands, would be his first experience in combat. Just as darkness was beginning to fall, on the evening of 21 NOV 1943 (D+1), Corpsman Hoatson was part of a battalion landing on the southern part of Green Beach, at the southwestern end of Betio Island. Hoatson, and about seven other Corpsmen and Marines, were paddling toward the beach in a small rubber boat. Hoatson and his companions had transferred to the rubber boat from a larger Higgins Boat, which had been launched earlier that day from the USS Feland. They were surrounded by large numbers of identical rubber boats, carrying hundreds of other Marines from the 1st Battalion, 6th Marine Regiment. The western shore of Betio, called Green Beach, had been occupied earlier by other Marines, and the 1st Battalion, 6th Marines did not encounter any direct fire from the Japanese defenders as they began their rubber boat landing. As Corpsman Hoatson and his small group paddled toward the shore, their rubber boat began to leak air and sink. One of the two LVT-1 amphibious tractors, that had been launched earlier from the USS Feland, stopped and rescued Hoatson and his companions from their sinking rubber boat. This LVT-1 then continued toward the beach. When the LVT-1 had traveled about a hundred yards or so toward the beach, the water became about waist deep. At this point, many of the nearby Marines could be seen getting out of their rubber boats and pushing them on toward the beach. It was in this general area that Hoatson's LVT-1 struck the Japanese boat mine. The resulting explosion blew the bow off the LVT-1 and turned the heavy vehicle completely upside down in the water. Nearby Marines and Corpsmen converged on the wreckage, after Hoatson was heard calling for help. Hoatson had suffered a compound fracture of his right leg. All the other occupants of the LVT-1 had been killed by the explosion. The other LVT-1 from the USS Feland came to the scene of the explosion, and stopped to assist. Arriving Corpsmen and Marines put Hoatson in a stretcher and placed him on the rear deck of the second LVT-1. This LVT-1 made it to shore and parked on the beach, in the narrow area between the water's edge and the seawall. This was in a location just north of the large 8-inch gun emplacement at Temakin Point, at Betio's southwest corner. Hoatson had been treated by members of his own medical unit, and his right leg, from the hip down, had been placed in a large metal splint. Still tied to his stretcher, he was left in the LVT-1 for the night, to await evacuation on the following day. Three of his fellow Corpsmen spent the night in a large shell hole nearby, sharing it with the remains of two Japanese soldiers. At about 0400 hours on the following morning, 22 NOV 1943, Hoatson was still in the LVT-1. The tractor's crew chief was awake and standing armed watch in the cargo area of the LVT-1. A Japanese bomber suddenly appeared and dropped a string of bombs along the southwest corner of the island. One of these bombs landed at the front of the LVT-1 and another alongside it. The LVT-1 was disabled, and the crew chief and Hoatson were blown out of it, and onto the beach. The crew chief was gravely wounded and narrowly escaped death. No one thought he would survive long enough to be evacuated, but today he is 85 years old, doing well, and living in northern Illinois. Hoatson was found on the beach, still in his stretcher, by the three Corpsmen who were spending the night down in the shell hole. They pulled him down into the hole with them, to protect him from further injury. Amazingly, he did not appear to have suffered any additional injuries from the exploding bombs. Later in the day, Hoatson was placed in another LVT and evacuated out to one of the troopships. One of the Corpsmen notes that Hoatson was a little apprehensive about trusting his luck to yet a third LVT. Hoatson's luck was holding though. Shortly after being safely taken aboard the troopship, he discovered that one of the Corpsmen working in his ward was a high school friend from his hometown of Sutherland, Nebraska. This would be the end of the war for Corpsman Hoatson. After a lengthy hospital stay, he was discharged due to his wounds. He would live to be 80 years old, and die in Florida. PhM3c Hoatson was taken off Green Beach and out to the USS Doyen on 22 NOV 1943. There is where he met up with his friend from Sutherland, Nebraska, PhM1c Walter J. Jochum, who helped with his treatment. PhM3c Hoatson stayed aboard the USS Doyen and was transported to the US Navy Hospital at Aiea Heights, Hawaii. He was then transferred from that hospital to the USS Solace on 17 DEC 1943 and transported to San Diego, arriving about 23 DEC 1943.